Startups are putting a high-tech spin on old-fashioned house calls — or “in-person visits,” since they can take place anywhere. The services provide non-emergency medical care — from giving flu shots to treating strep throats and stitching lacerations — much like a mobile urgent-care clinic. – Pager, in New York City, dispatches doctors or nurse practitioners via Uber, for $200. – Heal, in Los Angeles, San Francisco and Orange County, Calif., promises to “get a doctor to your sofa in under an hour” for $99. 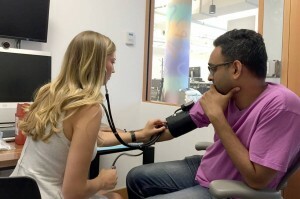 – RetraceHealth, in Minneapolis, has a nurse practitioner consult with patients via video (for $50), and only comes to their homes if hands-on care is necessary (for $150). – Atlanta-based MedZed sends a nurse to a patient’s home to do a preliminary exam. Then the nurse connects via laptop with a doctor who provides a treatment plan remotely. Such ventures are fueled by a confluence of trends, including growing interest in the so-called sharing economy, where technology connects providers with excess capacity and consumers who want on-demand services. Many doctors and nurses are eager for extra work in their off-hours. The services carry malpractice insurance, but say overall low overhead keeps prices down. Thanks to advances in mobile-medical technology, providers bring equipment with them, from portable blood analyzers to hand-held ultrasounds. The companies are attracting venture-capital investment and partnerships with hospital systems, which see in-home care as a way to reduce unnecessary ERs visits.